It seems like a logical progression: Realize you have a substance abuse problem, seek help and begin the journey to recovery. After all, as all those anti-drug infomercials teach, the life of an addict is hardly a glamorous one. With addiction comes myriad health issues as well as interpersonal problems and financial struggles. From the outside, it’s easy to see that there are a multitude of problems, some of them life-long, and zero upsides. So, why are there so many addicts that don’t seek treatment for their substance abuse problems? Addiction is a disease affecting more than 20 million people across the country – at least, that’s the number of people who meet the criteria for addiction as of 2012, according to a report from the Substance Abuse and Mental Health Services Administration. The shocking part? A whopping 96 percent of that 20 million did not think they needed treatment for addiction or even had a substance abuse problem at all. That means only 4 in 100 people even thought they had a substance abuse problem. Of that 4 percent who recognized they had a problem, less than half actually made the effort to get help for their addiction. Which begs the question: why do addicts not seek out treatment? Just like the metaphorical horse being led to water, you can’t force an addict to accept that they have a problem, and not even court mandated rehab treatments are entirely successful. Generally speaking, treatment for addiction is not going to be successful until the addict recognizes their problem and chooses to fix it. However, as families and friends of an addict, you can help your loved one with the support they need to be successful and overcome the hurdles on the road to recovery. 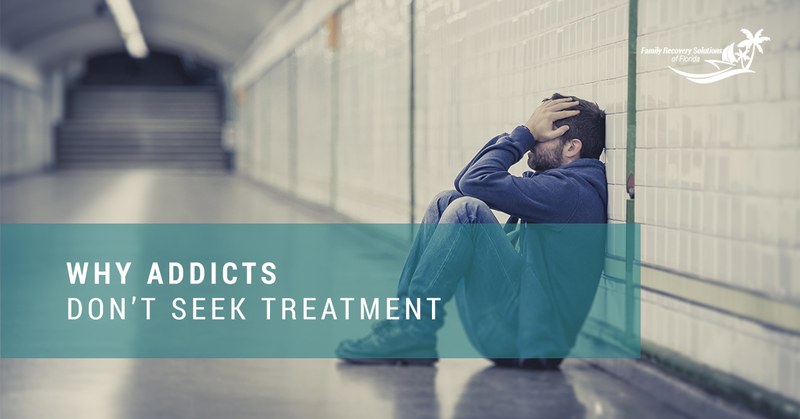 Denial – as we mentioned above, the vast majority of substance abusers don’t actually think they have a problem, or not one bad enough to warrant treatment. Along with this, many addicts hope that the problem will simply resolve itself. Fear – the detoxification and withdrawal process is a daunting one, and this fear can be strong enough to prevent some addicts from seeking help for their addiction. A closely related fear is that the treatment won’t help or won’t be enough which, like the fear of failure, can be a large roadblock. Shame – admitting to an addiction, especially to family and friends, can be a major limiting factor to seeking help. For some, they don’t want to be viewed as a failure, and for others, it’s the stigma of rehab itself because of the negative view much of our society has for rehab. Of course, those are not the only reasons, just the most prevalent. If you have a loved one with an addiction or substance abuse problem, contact Family Recovery Solutions of Florida. We will teach you the tools you need to help your loved one along the road to recovery without losing yourself in the process. Get resources, support, and counseling for parents of drug addicts in Palm Beach, so contact us today!